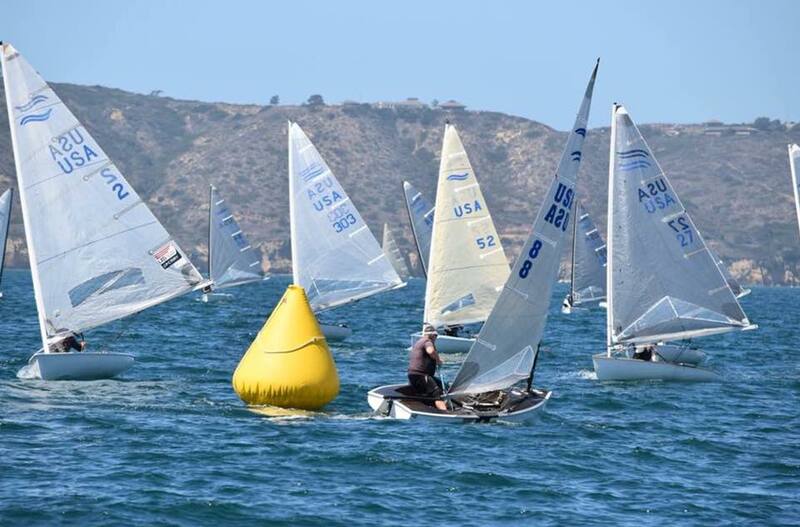 San Diego (September 19, 2018) San Diego Yacht Club hosted the first of the Finn Trifecta regattas – the Finn Pacific Coast Championships (PCC) this past weekend, September 15-16, 2018. Thirty Finns raced on North Coronado Roads tucked under Point Loma, battling for the championship title. The weekend’s conditions were what SDYC’s Commodore and Regatta Chair Michael Dorgan calls ‘champagne sailing’ with clear, sunny skies, mid-range temperatures and 8-10 knots of breeze to carry the sailors around the course. The races on Saturday and Sunday were consistent in that the top six finishers sailed neck and neck in all the races. Due to the course location, the winds were consistently favored right, but with enough shifts to encourage fairness for clean racing. Coming in first overall was Robert Kinney’s AK47, followed by Rob Coutts’ Priscilla in second and Paul Didham’s Hoop Dreams in third. Long time Finn sailor Rob Coutts started off the regatta with a first place on Saturday, and despite another bullet and a few seconds, he missed the win by one point overall. Paul Didham’s ability to finish third overall using a borrowed boat showed his true talent, sailing consistently all weekend. Commodore Michael Dorgan spent some time before the races giving Paul some hardy advice and tips for the course. “I guess I gave him too much info as he was showing me up on Saturday!” the Commodore joked. “I’d be lying if I did not say I was pretty jazzed [to win]. I tried to keep my nose clean at the start and not do too much dumb stuff on the course. My advice to others comes from advice I was given: Shut up and put the bow down!” Kinney commented. After racing concluded Saturday evening, sailors joined around the SDYC pool and Pavilion and enjoyed a Finn sailor’s meal: pulled pork sandwiches, macaroni and cheese and a delicious Kolsch Pilsner donated by regatta sponsor, Ketch Grill and Taps. 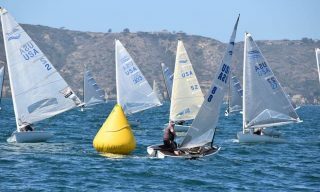 The Finn PCCs is sailed annually up and down the Pacific Coast, but after a four year hiatus, Commodore Michael Dorgan revived the event incorporating it into a One Design Weekend at SDYC. What started as a regatta with 10 Finns quickly grew into one of the largest Finn regattas. Coming up this weekend, you can find the Finn Master’s North Americans back on Coronado Roads. SDYC can expect to see a handful more Finn’s and sailors out on the water, including Darrell Peck, an top Finn sailor with more than 30 years’ experience and Olympic campaigns, World Championships and coaching expertise. Peck will challenge World Champion Henry Sprague and Rob Coutts, both winners of their age categories at the Finn Masters World Champions, as well as PCC Winner Robert Kinney and many other hopeful Finn Champions.